A contribution of $500 promotes philanthropy in Central Texas by honoring leaders and educating the community. 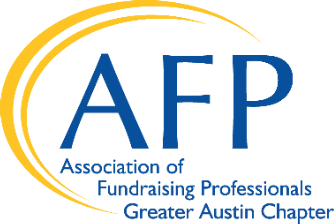 A contribution of $250 helps provide national and high-level speakers to bring the highest quality of learning to Central Texas fundraisers and nonprofit leaders. A contribution of $100 trains diverse community members in fundraising best practices and trends in Austin. A contribution of $50 provides members a year-long 1 to 1 mentorship, matching experienced and rising leaders. A contribution of $25 provides training and a valuable networking opportunity in Williamson County.